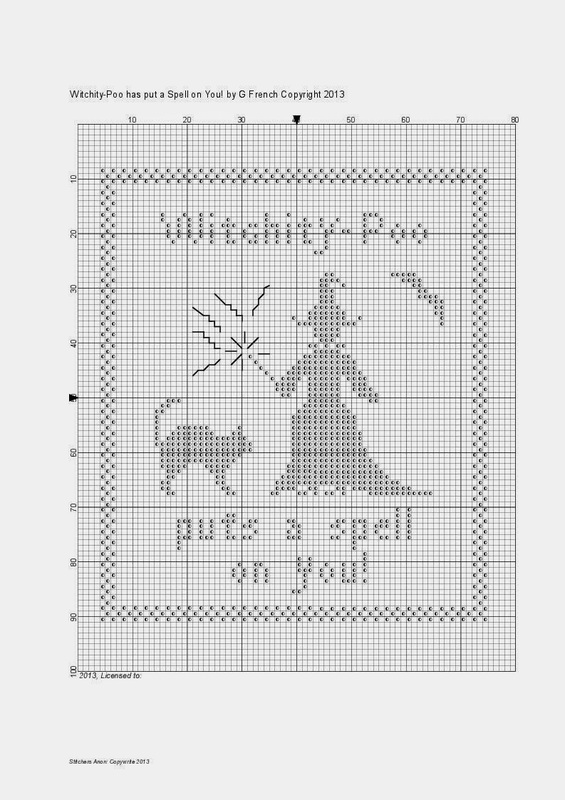 Stitchers Anon: Hand Made Halloween Exchange and a Freebie! Hand Made Halloween Exchange and a Freebie! I recently took part in the Hand Made Halloween Exchange organised by Kim . It was a wonderful exchange but probably the last I will take part in because pure and simple, my memory is rubbish to the point my short term memory is completely shot and if things don't get into the short term memory, they have no chance to make it into the long term memory. The cancer care nurse said it could be the effects of the Tamoxifen, so as I'm hopefully going to be on it ten years, I guess I had better just give in gracefully! From Renee I received the most wonderful items, all hand made by her! I even had a card made using a photo of the ornie! Rennee used crazy quilting and the details on the ornament is amazing. She made the purse as well! The spooky trees were made using stitching: the graves were felt which was painted and stitched on and have names like 'Ima Spook'. The spiders and webs were sewn on (top right of the ornie) and beads were added around the pictures of the haunted house so all in all there are three ghosts to match the three graves. I've never seen anything like it! The attention to detail is amazing! Thank you so much Renee! My exchange partner was Teresa. There werew some beads as well but no idea where they are on the picture. The design is one of my own which I altered. Feel free to use and alter as you wish too! If you right click and save it and then print it should come out just fine. Right, what is new? Well the Ghost of Christmas Present has been a bit of a pain but we are getting there and he should be finished soon, hopefully by tomorrow. I'm also now a DMC stockist now and have just received my first order of DMC fabrics: aida, linen and evenweave! I don't know if you remember but I was pretty miffed when I ordered one thread from a well known UK shop and they charged me five pounds postage! And it came in a normal letter size envelope! Terrible. A complete rip off. I emailed them to query it and they didn't even bother to get back to me. So I did what I usually did: I lost my temper and I contacted several big companies and am now distributer for them all rofl. I'm starting with the fabrics because we just can't get them here and then I'll work out my prices and hopefully come up with something fair for the stitchers in Ireland which doesn't involved huge postage costs! I'm also distributer of two well known American companies but I have to work out the rules for import duty etc to see if I can still make it worthwhile. All good fun. Oh and I have a brand new project the results of which I hope to show you soon. All I will say is organic and exciting! Right, must go and cook lunch for the in-laws. Have a hauntingly good weekend! Love the gifts - given and received. Thank you for the freebie - love, love, LOVE it! The ornament you made for Teresa is darling! Thank you for sharing the freebie pattern. I am so glad you like your Halloween ornament and coin purse. They were SO much fun to make. Those are both lovely Halloween exchanges :) I hope the new business venture works out and you can keep the postage lower. If I ordered just 1 chart from a USA online LNS then I have to pay $7.50 CAN for shipping so I usually order a few things at a time to make it worthwhile. Great gifts for the exchange. I'm sure both of you were very pleased. Thanks so much for the freebie. It's such a cute piece. Lovely exchange gifts Gaynor. Thank you for the chart. The gifts sent and received look great!!! It was really fun exchange!!! sweet freebie and lovely exchange gift..
Super gifts you both chose for the exchange and such pretty stitched things too. Good luck in the new venture, I'm sure it will be a huge success. Thank you for the freebie! It will be fun to stitch! I love what you sent and what you got!! This was a great exchange! I love your design and all the goodies in your exchange. Good luck with your floss and fabric business! Looks like a fun exchange!